On December 13th, a Tacoma-based jury declared five Disarm Trident Now Plowshares activists “guilty” of trespass, felony damage to federal property, felony injury to property, and felony conspiracy to damage property. 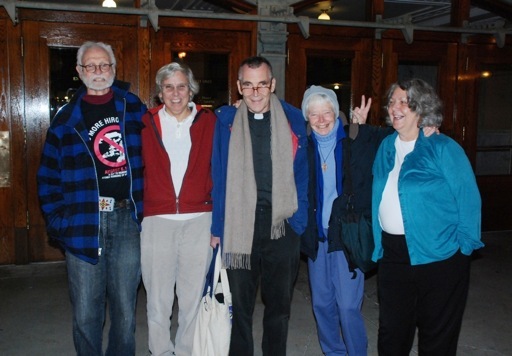 The charges against the Disarm Now Trident activists resulted from their November 2, 2009 Plowshares action at the Kitsap-Bangor Naval Base, which is located just outside of Bremeton, Washington. The activists, who will be sentenced on March 28th, 2011, each face a potential prison sentence of ten years. After the jury rendered their verdict, Father Steve Kelly “faced the jury, and all the Disarm Now Plowshares defendants stood with him with their hands raised in blessing as he said, ‘May you go in peace and have a safe, happy holiday.’” These words and loving gesture well encapsulate the profound spirit that animates the witnesses of Plowshares activists and their supporting communities, as well as that of generations of nonviolent peace activists and actions that root the Plowshares. The eight Trident nuclear submarines home ported at Naval Base Kitsap-Bangor each carry 24 Trident D-5 nuclear missiles. Each missile carries up to eight warheads, each one having an explosive yield of up to 475 kilotons, over 30 times the destructive force of the weapon dropped on Hiroshima. Additionally, Bangor is home to SWFPAC where nuclear warheads are stored ready for deployment. Located just 20 miles west of Seattle, it is home to the largest single stockpile of nuclear warheads in the U.S. arsenal, housing more than 2000 nuclear warheads. According to the Natural Resources Defense Council, the 2,364 nuclear warheads at Bangor are approximately 24 percent of the entire U.S. arsenal, more than the combined nuclear warheads than China, France, Israel, India, North Korea and Pakistan. The importance of the Disarm Now activists and action—indeed of each of the over 150 Plowshares actions since 1980—is that they show us how not to be held captive by The Bomb. Each of the activists has spent the better part of their lives working in service to others, risking numerous arrests on behalf of peace, living unencumbered by consumerism, building loving communities, and, in some cases, risking their lives in war zones. Given the possibility of a ten year prison sentence, they demonstrate what it means to “pay the price” that peace in our world demands of us.